(Before reading Epistle): If the epistle sounds a just little cryptic this morning, it should be enough to understand that Saint Paul is recalling an event from the Old Testament, calling to mind how some of the people being led through the desert. out of Egypt, were being unfaithful to God even though He had been providing for all of their needs. The important theme here is the importance of fidelity to the one true God; fidelity will be rewarded, infidelity will be punished. One of the unfortunate stereotypes of Christianity is that it is a “hell-fire and brimstone” religion. In the movies, a sermon is expected to be delivered in an elevated voice, and to contain numerous warnings and chastisements. The popular conception is that the Christian God is an angry God, and that His ministers have to preach sermons filled with the same emotion. Some of this misunderstanding of what Christianity is all about stems from a lack of understanding of God Himself. The person who sees God as primarily the angry God is making the classical mistake of man making God in his own image, rather than the other way around. We humans tend to be short tempered and unforgiving—longer on anger and jealousy—shorter on compassion and mercy. Of course, we would be wrong to think that we have nothing to fear if we refuse to keep the Commandments. We would be foolish indeed if we were to suppose that, after giving us a knowledge of the Faith, God will not hold us accountable to practice it. The truth of the matter is that God is both merciful and just. The Gospel this morning tells us that Jesus wept when He saw Jerusalem—that He knew that the people He had favored with His revelation—His "chosen people"—would reject Him. 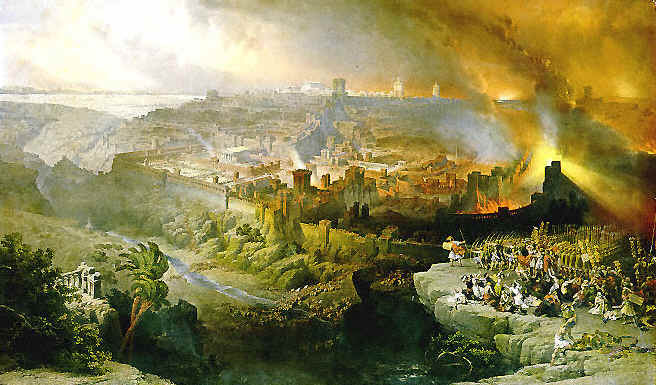 Both literally and figuratively, Jerusalem, the city of God, would be smashed. Not one stone would be left standing upon another stone. This would physically be accomplished when the Romans sacked the city about 30 years later, leaving very little standing. But it would be accomplished in a more symbolic sense when the Jews rejected their Savior, and crucified Him. And, all the more, we read of God's mercy in the New Testament. The parables of the Prodigal Son, and those of the shepherd and his lost sheep. The constant call of sinners to repentance. “Thy sins are forgiven thee—go and sin no more.” The miracles our Lord worked to heal the sick of their physical ailments. And, most of all, we see in our Lord's very life the mercy of a God who loved His people enough to become one of them and to lay down His own life for them. However, we must not forget that God is also just. Of His very nature, He is motivated to give everyone what they are due. We would be foolish indeed if we were to expect God to reward us for each and every achievement, yet expect him to look the other way when we have done something wrong. Justice and mercy are united in God. We might think of them as the two sides of the same coin. This is clearly to be seen in today's Gospel, wherein we see our Lord weeping over the destruction of the Temple—and then going inside to drive out the money changers! God is generous, and His rewards are often greater than His punishments—but we have no right to expect or demand this of Him. Perhaps the most generous thing God has done is to let us know what is expected of us. In the Psalms, King David rejoiced: “He has proclaimed His word to Jacob, His statutes and His ordinances to Israël. He has not done this for any other nation; His ordinances He has not made known to them.” As Saint Paul tells us, we have the example of those who were punished for their transgressions in the Old Testament. “These things are written for our correction.... so that no temptation may take hold of you.” And again, he tells us that God will not allow us to be tempted beyond our strength. His mercy and justice together won't allow that. We ought to be impressed with God's justice. It will bring us our just reward, but is also something to be feared. Yet that fear should be a healthy fear. God is also merciful. And that mercy ought to inspire our love of Him. Our understanding of God must not be one sided. It should not be all fire and brimstone, but neither can it be all roses. There is a balance between God's justice and His mercy. Perhaps it is best summed up in the Gospel which tells us that “God so loved the world that he gave his only-begotten Son....” In this one act, we see both God's love and His justice. I hope that it will move us to the love and justice which are proper to our human nature—that, each of us, loving God, will keep the justice of His Commandments.